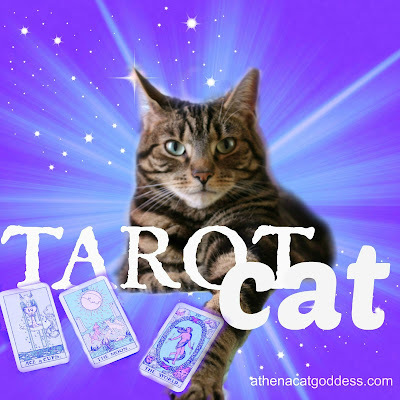 Here is the Tarot Reading we did for lovely Rosie from The Daily Pip, who won our latest Pet Tarot Reading Giveaway. Thank you for letting us share on our blog! The first card drawn is the MAGICIAN. This card symbolises creativity, the creating of a new life and dreams coming true. The purity of your own dreams and wants. In the past position, this card encourages you to display your unique talents to accomplish what you desire from life. I feel this applies to Rosie as she knew what she wanted, went for it and got it for sure. As a true little fighter she never gave up on herself. This passionate little girl is also very wise, can direct her thoughts to the right pace. Just one look at her and everyone falls in love with her. In this position we have the KNIGHT OF SWORDS. Now, the Suit of Swords is associated with lots of action, change and conflict, and the Knight of Swords for a cat means there is no stopping our lovely Rosie. She often gets this high burst of energy, inspiring everyone around her to join in the fun. She is telling you - her human, guardian - that any challenges that you feel exist at this current time should be met with an "I will beat you" mindset. There really is no stopping this kitty and it's the same for you. Knights also represent messengers and swords represent ideas, words and thoughts. New ideas are coming to you all the time. Note them down, they could prove useful. The Knight of Swords in the present position indicates that you are getting some good news (though at first you may not think this is so). All is for the best in the long run. If there is something you have been avoiding doing, don't put it off any longer. Rosie, as I have said, is in fact a very wise cat, a wise old soul. She is a thinking cat, not just one of actions. You will always find her going off and meditating on her own. She often needs to be alone with her thoughts. In this position we have drawn the HIEROPHANT. This is a card that suggests someone that likes to follow convention and is a bit worried about stepping away from the traditional way of life for fear of what people might say. A cat might not feel this way, but perhaps Rosie feels like this in relation to the other pets in the household. It could also mean that Rosie herself is in your life to show you how to be more free-spirited, like a cat, who really doesn't care what anyone else thinks! Live your life for you. Do what makes you happy. I can see that the sharing of knowledge is important to someone. Maybe someone is interested in further  study, and I feel this is linked to a more spiritual subject, though not necessarily a religious one. Certainly, there is more spirituality surrounding everyone at this present time. And this I feel means that Rosie is in your life for a reason. So, as a whole, this reading today tells us that Rosie is a wise old soul that has been in your life many times before, she knew where to find you and is grateful for the life you have given her. She loves being a part of your family, enjoys her life immensely. Wow, what a great reading Rosie got! So interesting. We love that she is an old soul, and has so much wisdom to share with her human. Hugs to you both, Athena and Mum Marie! That is a great reading. Hopefully it will provide great wisdom to her mom in how to understand her better. Very interesting reading. Those cards are beautiful too. That was a GREAT reading! Excellent reading! We enjoyed it! 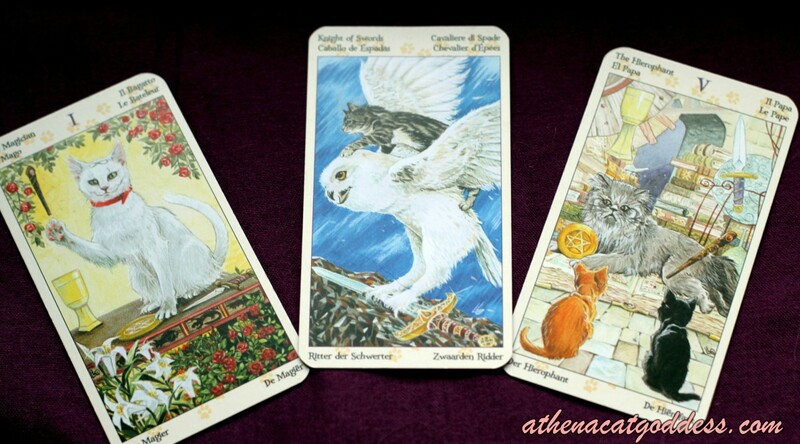 Cool reading and cool cards! We had so much fun with this reading. You really captured Rosie's true essence. Glad to know she is an old soul! Thank you so much!